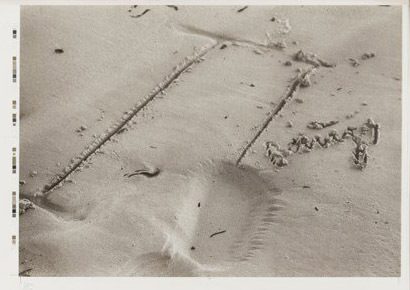 The two lines in the sand refer to an early work “Intuition” Kat.28/mutiple” from 1968. They symbolise the difference between knowledge (the first limited upper line) and intuition (the second open line). Beuys believes that intuition is more reliable and stronger than acquired knowlegde. The second ‘intuition’-line ends in a well and gives the work an extra dimension.